You'll receive this task from Gordy in Copperlane (#1). Gordy will tell you that he knows a "really good secret" about people who hide "really neat things." If you show interest, then he'll make you an offer -- if you bring him a March Steel Dagger, then he'll tell you where you can find the hiding place. To help you out, he'll inform you that Igrun (#4) has a March Steel Dagger for sale. If you use the Might or Resolve dialogue option, then you'll convince Gordy to tell you about the hiding place without having to fetch the dagger first (with the only downside being that the Might option will cost you a "minor" reputation loss with Defiance Bay). Gordy will then inform you that the hiding place is located next to the theater (#5). You'll have to turn on sneak mode to spot the hiding place, but inside you'll discover an Oaken Scarab Figurine and more. You can fetch the dagger for Gordy. For this case you'll first need to visit Igrun (#4), who will tell you that he sold the dagger to an adventuring party staying at the Goose and Fox (#2). With Intellect 12, you'll realize that Igrun shouldn't have had a March Steel Dagger at all, and if you follow that up with the Clever response, then you'll earn a small (roughly 3%) discount at Igrun's shop. You can negotiate for the dagger. Weaxel will ask you for 100 cp, but you can reduce that price to 50 cp using the Intellect 12 or Resolve 14 dialogue option. You can attack Weaxel and his party. Weaxel will drop the dagger when he dies, and you'll also find a Ring of Deflection on Key's corpse. 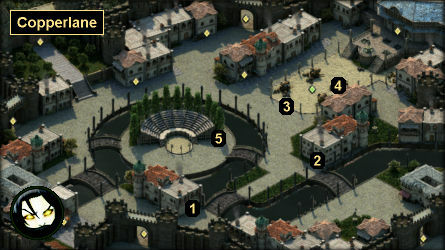 When you bring the March Steel Dagger to Gordy, he'll tell you to look by the theater (#5). You'll have to turn on sneak mode to spot the hiding place, but inside you'll discover an Oaken Scarab Figurine and more. Note: If you give Gordy the dagger, then after exiting and returning to Copperlane, and returning to Gordy's position (#1), you'll witness Gordy being chewed out by his father Hamor. Gordy will point you out as the one who brought him the dagger. What you say won't change anything in the game, but lying to Hamor will get Gordy into extra trouble. Another Note: If you give Gordy the dagger, then at some point later in the game, you might hear the town crier (#4) announce that a boy recently lost several fingers while playing with a dagger. A Third Note: You don't need to work with Gordy to find the hiding spot. You can detect it at any time.